Ashton Kutcher, Josh Gad, Matthew Modine, and Dermot Mulroney star in the Steve Jobs bio-pic drama, jOBS. The film chronicling the life of Steve Jobs, the Apple Inc. co-founder and charismatic master of innovation has been pushed back to a later date. Five Star Feature Films and distributor Open Road have pushed back the released date from April 19, 2013 to a new date that has not been determined. The film was originally scheduled to be released in late fall 2012. 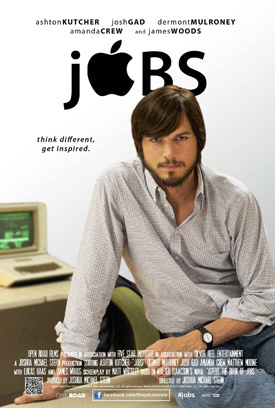 Ashton Kutcher plays the iconic title role in jOBS with Josh Gad (NBC’s 1600 Penn) as Apple co-founder Steve Wozniak. The film will shed new light on Steve Jobs’ most defining and personal moments, motivations, and the people that drove him.